The Mogwai Amp offers more than an entry point for tube amps, but a hybrid product, meant for serious headphone and speaker use. The Mogwai offers 3 watts/channel making it appropriate for 95db loudspeakers in both a desktop near field set-up or traditional set-up. Mogwai is a tube rollers dream with access to limitless options of NOS tube choices. 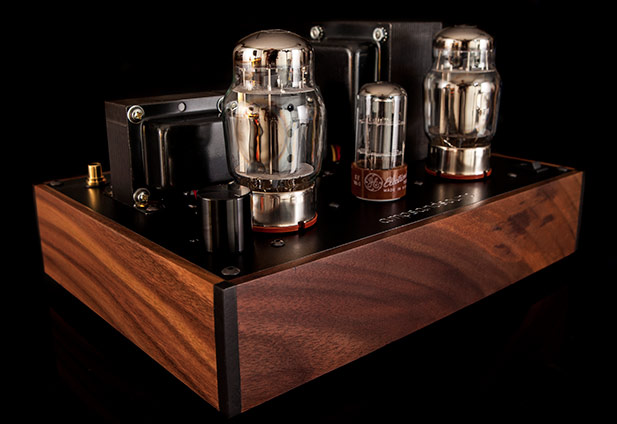 The Mogwai is unique because combines the features of a full-sized two-channel power amplifier and headphone amplifier in a chassis that is suitable for a desktop use. Measured with 6550 output tubes on 1/4″ 32ohm optimized headphone jack. Measured with 6550 output tubes on 8-ohm tap.